Plugging your acoustic-electric guitar directly into the PA is convenient. But you're at the mercy of the engineer. That's why Trace Elliot created the Transit A acoustic preamp pedal. Plug into the Transit A before connecting to the PA. It has all the tone-shaping tools you need to achieve a professional sound: a 3-band EQ, Chorus, Delay, Reverb, a tuner, and more! The Transit A's color-coordinated backlit controls make it easy to see on a dark stage. And it fits in your guitar case! 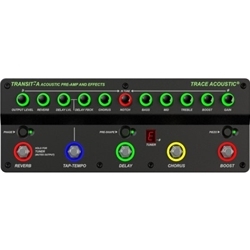 The Trace Elliot Transit A acoustic preamp pedal includes a high-quality embroidered carry bag and top-notch software package.